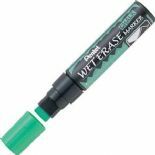 Pentel Wet Erase Chalk Markers can be used on lots of surfaces. They can be used on mirrors, windows, chalkboard labels, slate, stone, chalkboards and any non porous surface. 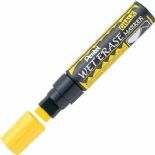 They can easily be removed with a wet cloth or for more stubborn stains you can use one of our chalkboard cleaners.